That wonderful feeling when you receive a little parcel in the post full of seed packets…is one I enjoy a bit too much. Hence, I may have overdone things a bit when it came to ordering seeds. I ordered lots and lots of cacti seeds of various genera from Ariocarpus to Gymnocalycium and Puna to Rebutia, to Obregonia and Sclerocactus and so on. I also ordered seeds from various Mesembs, particularly Lithops and Conophytum which I had never done before, and some other succulents and even some non-succulents. It is a lot of fun to peruse seed lists and see all there is on offer. Between the nurseries mentioned here and all the other dozens and dozens out there, I’m sure one can find seeds on offer for just about any species and form ever described. Mesa Garden is particularly strong on North-American cacti, but have an excellent selection of most genera. They also have a very good selection of Mesembs and other succulents. 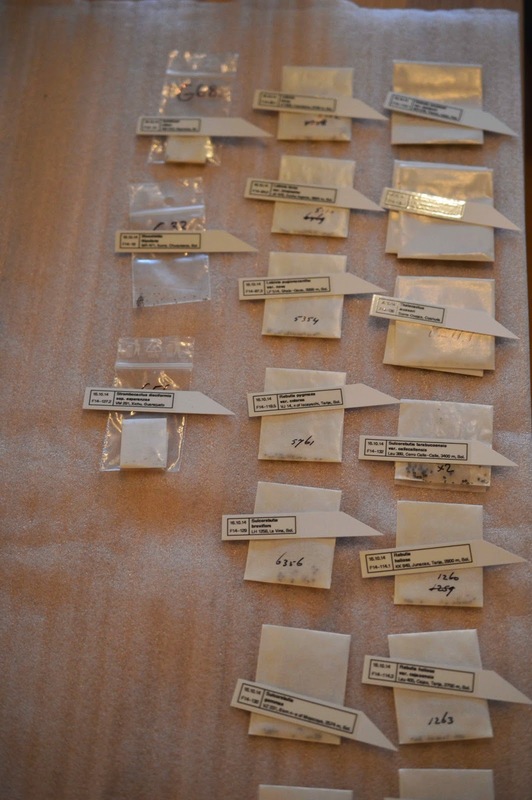 A large number of the species come with locality information and collection numbers. Mesa Garden is also known to be diligent in ensuring that species with collection numbers are not crossed with specimens with different collection numbers (which not all nurseries are). They do not have an online store, but they have easy to use order forms you can e-mail them, or you can use Excel-sheets. Delivery times to Norway are usually one or two months, but can take up to three months. This is largely because they first of all are very busy but also because when ordering (from outside the U.S.) species on the CITES check-list they have to acquire a CITES certificate from the authorities to enclose with the parcel. This can take some time and is not any fault of theirs. Germination rates are usually very good. Seeds of the wonderfully interesting Welwitschia mirabilis of the Namib Desert. The wings surrounding the seed are to aid with airborne seed dispersal. The plant is a relic from the time of the dinosaurs and it can live for a thousand years or more. it is certainly no succulent. 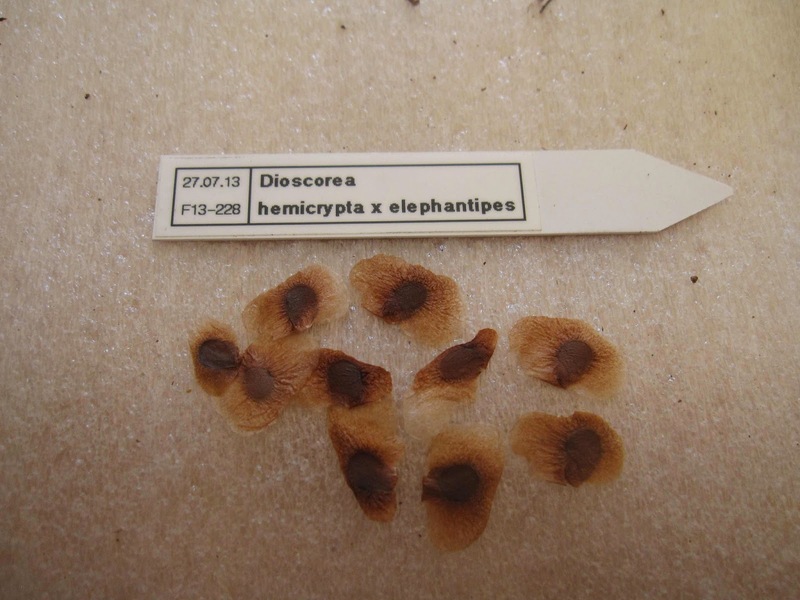 Seeds of Dioscorea hemicrypta X elephantipes. above ground from which stems sprout. SuccSeed is strong on South-American cacti and perhaps in particular Rebutia. A large number of the species come with locality information and collection numbers. They also sell various accessories such as pots and books. Their website is very good and easy to order from. Delivery times to Norway are very good, and usually the parcel arrives in a week. Germination rates are usually very good. 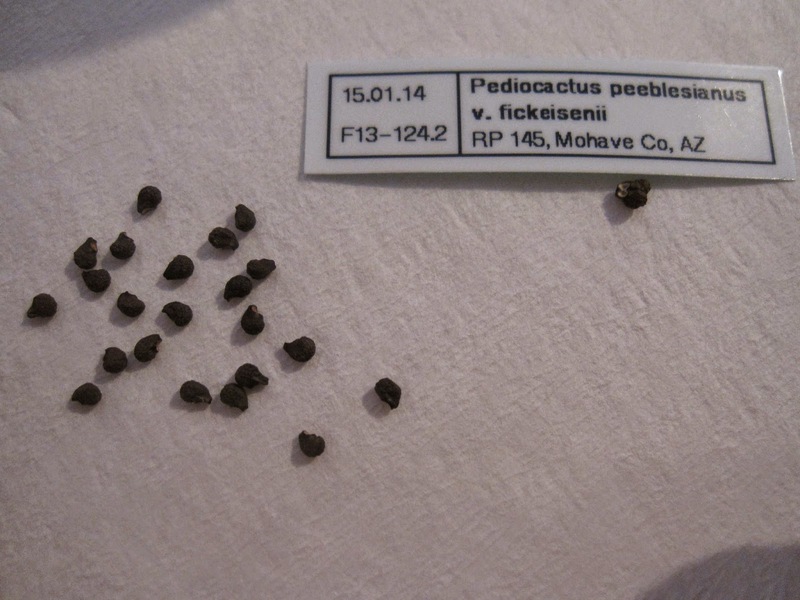 Seeds of Pediocactus peeblesianus var. fickeisenii (ca. 2-3 mm wide). The seeds are large and difficult to germinate without some form of treatment. Directly below the label can be seen a “double” seed. I have never seen anything like it before. up with another and, in fact, two plants sprouted from it. See Part 5 of this series for a picture of them. 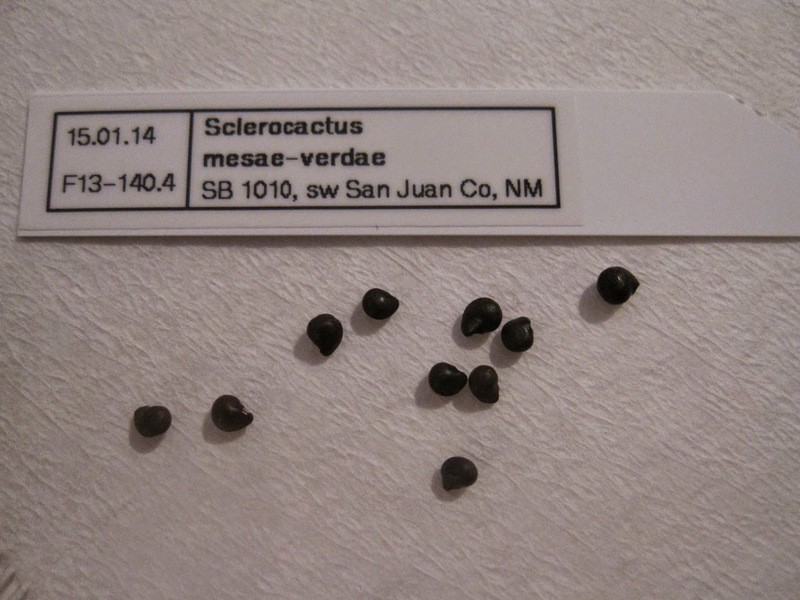 Seeds of Sclerocactus mesae-verdae (ca. 3 mm wide). of the seeds germination was surprisingly good! Bercht is particularly strong on South-American cacti and in particular the small globular South-American genera (Gymnocalycium, Frailea, Rebutia etc.). Most of the species come with locality information and collection numbers. They do not have an online store, but like Mesa Garden you can send an Excel-sheet. Delivery times to Norway are very good and usually takes around three weeks. Germination rates are usually very good. 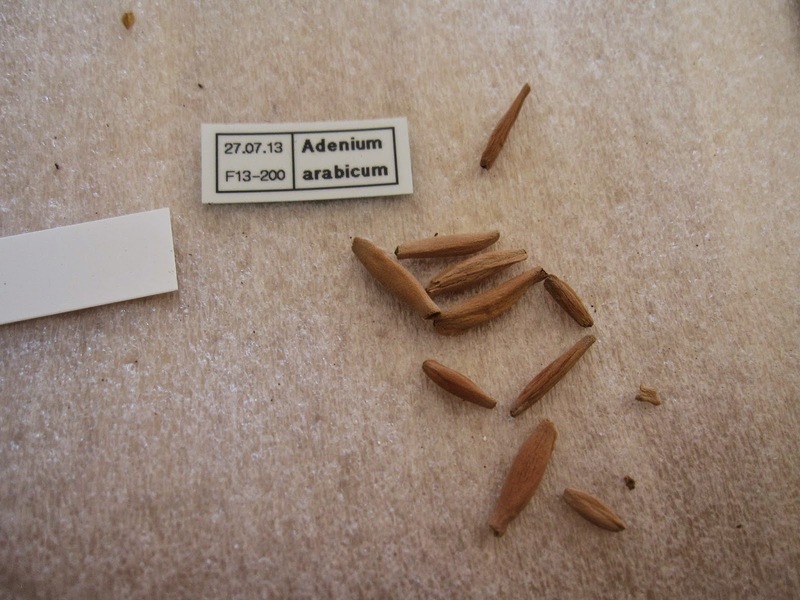 In addition to the above, I also sowed seeds of A. obesum and A. multiflorum. The latter began flowering one year after sowing. 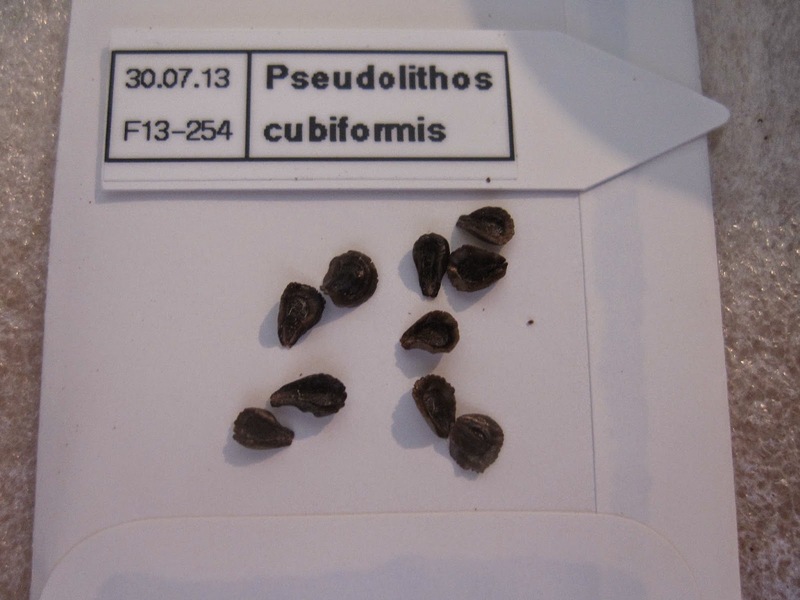 Seeds of Pseudolithos cubiformis (ca. 4 mm wide). more like a living rock than any Ariocarpus or Lithops. Piltz have a wide selection of genera with many interesting species. Not as many species come with locality information and collection numbers as the first three nurseries. They have an online order form you can use, or you can also send an order form on e-mail. Delivery times to Norway are very good and usually takes around three weeks. Germinations rates are usually very good. 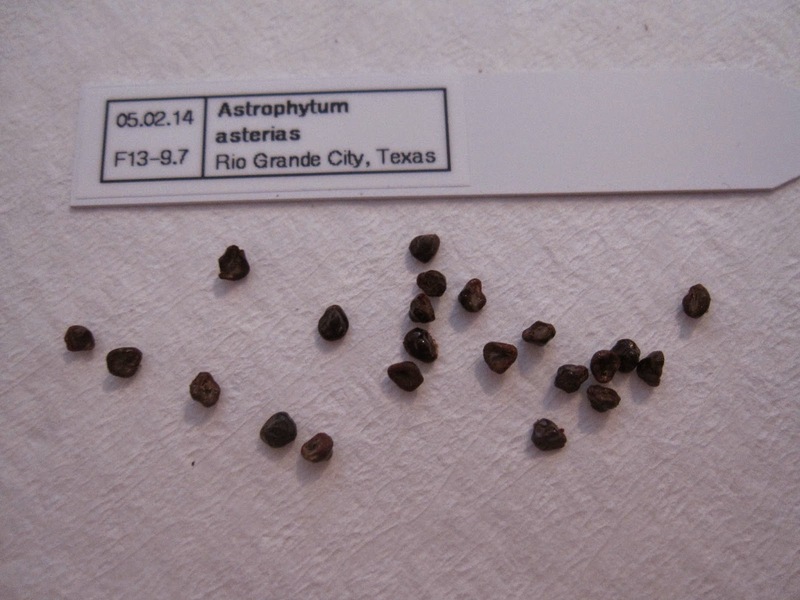 Seeds of Astrophytum asterias (ca. 2-3 mm wide). germinate readily – often starting to appear just three days after sowing. 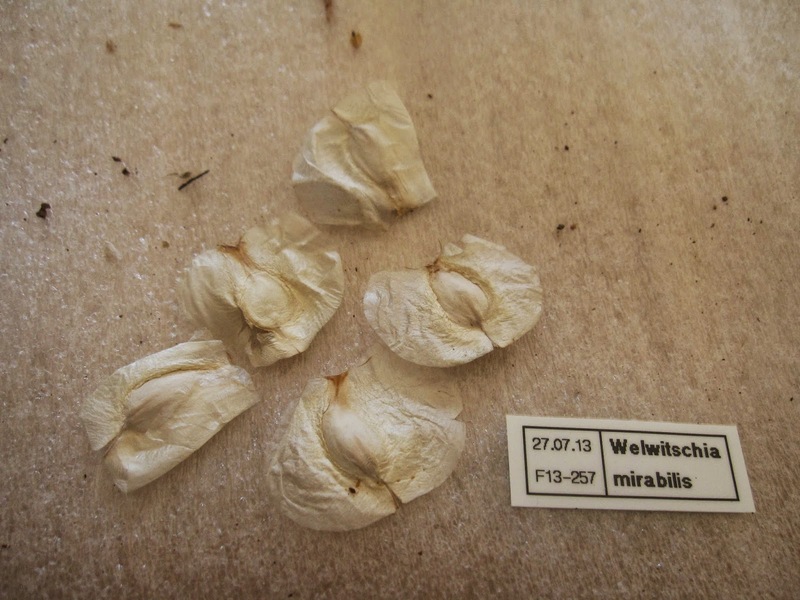 Seeds of Ariocarpus trigonus (ca. 1 mm wide). while in others they may pop up happily. Köhres also have a large selection of genera, and are quite strong on Astrophytum and Lophophora among others. They also have a large and varied selection of succulents, caudiciforms and various other interesting trees and plants. Not as many species come with locality information and collection numbers as the first three nurseries. They have an online store you can use, though it is not as good as SuccSeed’s. Delivery times to Norway are very good and usually takes around three weeks. 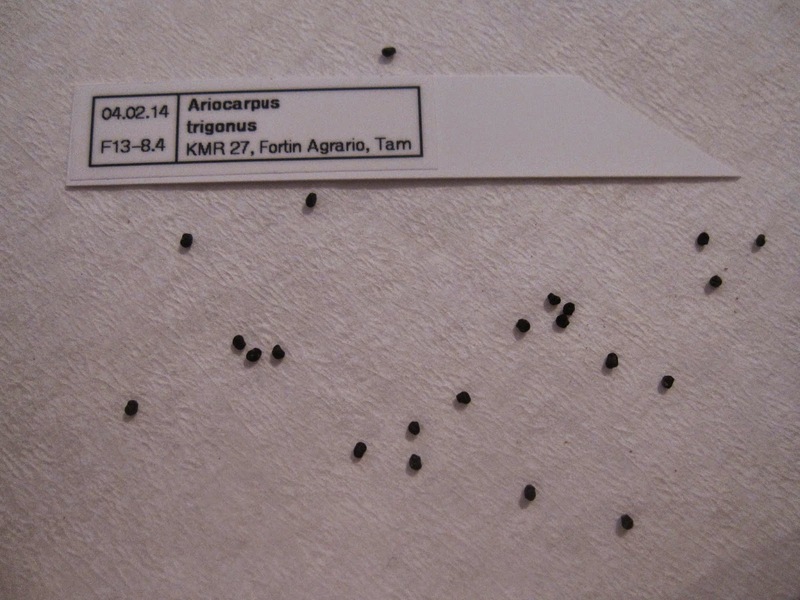 Germination rates have been a bit hit and miss for me, but generally lower than the previous four nurseries. 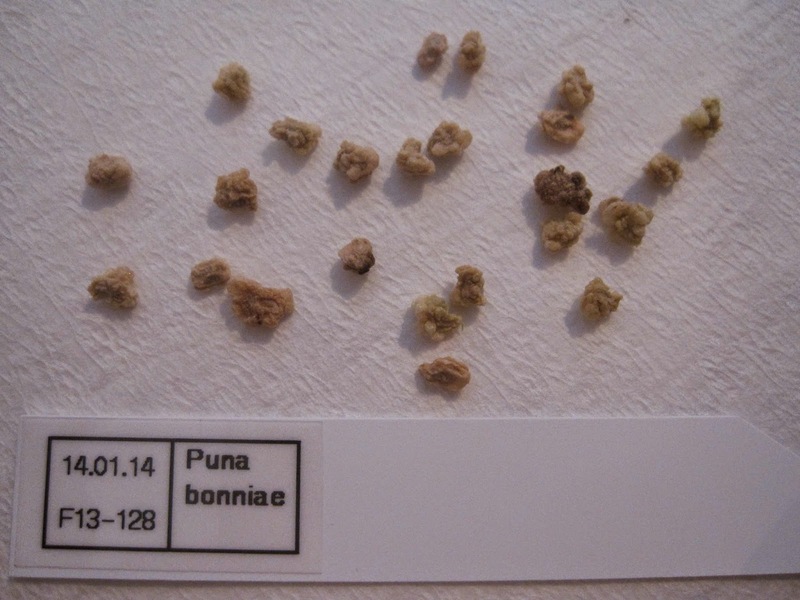 Seeds of Puna bonniae (ca. 3-5 mm wide). This is a very attractive Argentinian species with very strange-looking seeds for the cactus family. often difficult to germinate though. 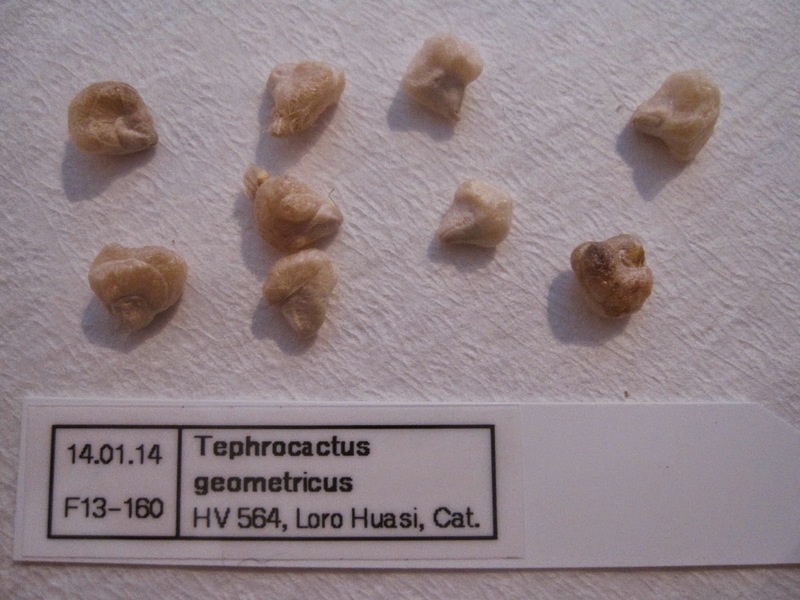 Seeds of Tephrocactus geometricus (ca. 5-8 mm wide). This is another member of the cactus subfamily Opuntioideae, also with interesting seeds. It is somewhat similar to Puna bonniae pictured above, both from the same region of Argentina. This species had a 50 % germination rate though, and the plants are growing happily. Kaktusy have a very wide selection of genera with usually more than one (and sometimes dozens) forms of the same species from different localitites. Very strong on the North-American genera such as Ariocarpus, but also on many of the South-American genera. They have an online store you can use, but it is not the most practical, and the site is not the easiest to navigate either. This is the only nursery on this list I had not ordered from before, and I may have been very unlucky, but germination rates were largely very poor. I have recently ordered from them a second time and I will update this once I receive and sow those seeds. As I have only ordered from them once, it’s difficult to comment on delivery times, but it took three and half months for the order to arrive. I don’t know if this is usual, but I believe it is common with many Czech nurseries that delivery can take several months. I think many of them are run as co-ops, so it’s possible that the delivery times are a result both of being busy, but also of having to wait for different suppliers to deliver their seeds. It is not really a problem though, as long as you are aware of it. 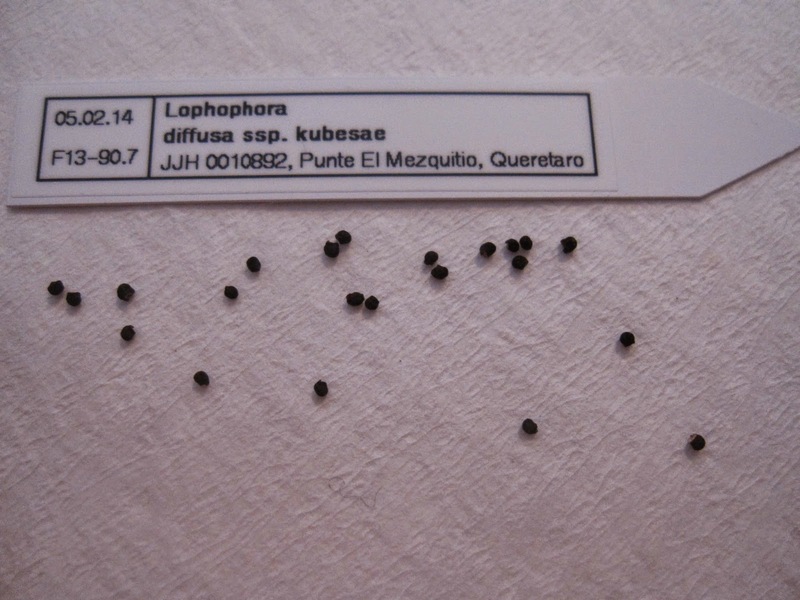 Seeds of Lophophora diffusa ssp. kubesae (ca. 1 mm wide). is merely a regional form of L. diffusa, but I look forward to seeing how it turns out. does not contain any mind-altering alcaloids. Little bags of seeds happily awaiting sowing! Seeds usually come in bags like these. catalogue number referring to the respective nursery’s seed list.